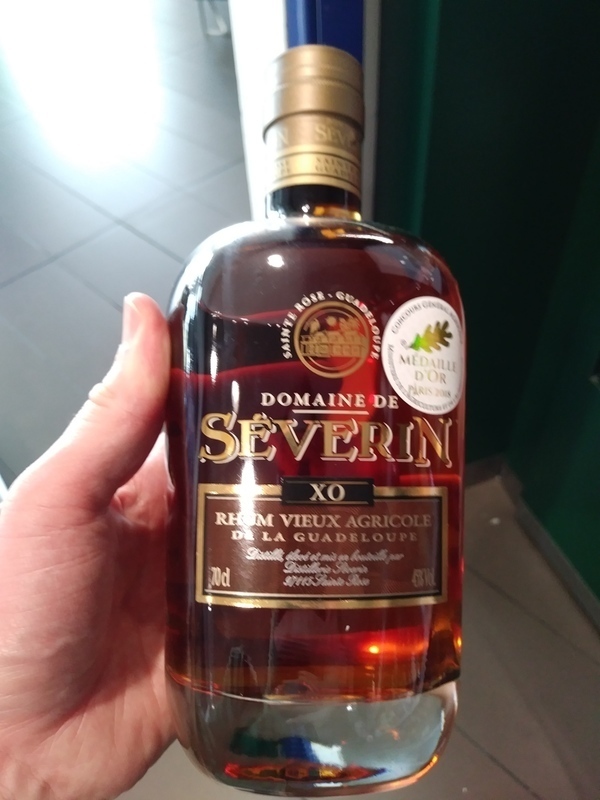 Have you found an online vendor selling Domaine de Severin XO? I think most of the negative comments I have read about this rum comes from the fact that it is an agricultural rum, which is therefore quite different from what most (=non-French) people call rum. I am not into agricultural rum, but I found this one interesting and refined. The smell and taste are that of sugarcane, which is pretty good. This is to me what most people would refer to as a taste of herbs. Agricultural rums form a category of their own, and I suspect this one to be a very decent one. I would therefore recommend non-French rum afficionados to taste it, if they have a chance, keeping in mind that it will be different from what they know. Just back from this years rumcruise at the Baltic Sea with Birka cruises. Tested this and bought me a bottle to my Guadeloupe collection. It’s a blend of Rhum that’s at least six years old. I’m a big fan of Guadeloupe Rhum, but I don’t think that this one can compete with best ones. But don’t get me wrong it’s very good and smooth. In nose and in mouth you can recognise vanilla, banana and wood. The afterburn is quite long, dry and spicy. Visited Guadeloupe over the Holidays and truly enjoyed a great distillery tour at Domaine de Severin. Bought a bottle of XO from the distillery since they had a very limited tasting bar. Nice and sturdy bottle and label design. Surprisingly dry Rhum Agricole flavors complemented with grass, citrus, floral notes and plenty of oak to your nose and palate. Strong burn at the end being so dry. Rhum Agricole lovers can easily add 2 points to my score. It,s rum? More like avarage quality whisky for me. Smell & taste strong medicaments, hispital... Strongly sensible alcohol. the taste ist light but spicy and the Rum cant hide his Bourbon casks origin. Im not into Bourbon but no reason top downvote. Maar 20ml uit een advent kalender. Agricole met whisky trekjes. Lekker. Agricole rum have a special place in my heart. The idea about no suger added have always intrigued me, and it is something that is needed in a world filled with sugary bombs. Overall: This is a nice agricole rum for people wanting to get into the style. The aftertaste is a bit off for me personally, but it is a rum that everyone should be able to enjoy. Deep amber colour. The nose is on the candied fruits, the wax of old furniture. Maybe even leather or shoe wax. A firecracker sensation after ignition. Very particuliar. In the mouth, we are on the same notes with old wood, like oak furniture. A final not very long but woody. Quite disturbing as aromatic but interesting sensation. In der nase recht lecker ! Der Abgang geht gar nicht! Taste is to much % for me. Liked the smell of it, but it didn't quite delivery it in the taste, not the worst rum, but not was I was first expecting. Even more whiskey notes than the previous #3 from the rum calender 2017. Honig gelbes Bernstein im Glas. In der Nase, rauchig, verbranntes, harziges Tannenholz das mit Karamell übergossen ist, dazu gibt's einen Topf voller verkochter tropischer Früchte. Im Gaumen ein sehr kraftvoller Auftritt, kleine Vanille Bomben explodieren auf deiner Zunge und hinterlassen Aromen von Gewürzen, Früchten und gebranntem Zucker. Holznoten gesellen sich dazu. Im Abgang schön lang, mit Bananen und einer gewürzten Süsse. On the nose, smoky, burned, resinous fir wood doused with caramel, there's a pot of overcooked tropical fruit. A very powerful performance on the palate, small vanilla bombs explode on your tongue leaving aromas of spices, fruits and burned sugar. Wood notes join in addition. On the finish beautiful long, with bananas and a spicy sweetness. Fun to try a agricole rum but it's not for me. I wonder if I ever will apriciate an agricole rum. I hope so, maybe it takes time to learn to like them. Nose: grapes, figs and plums. Palate: grapes, figs and plums.